Sometimes eating something sweet, old-fashioned and comforting on a Sunday afternoon is just what I need. This tea brack fits the bill perfectly. The recipe comes from Theodora Fitzgibbon’s book A Taste of Ireland. Making the brack is simplicity itself, the most time-consuming element is weighing out the various ingredients. You will need to start the process the night before you plan to eat it. Here’s how to make it. Soak 300g of mixed dried fruit (sultanas and raisins) and 150g of brown sugar in 225ml of milkless tea overnight. The next day, add 150 g of plain flour, one level teaspoon of baking powder, one teaspoon of mixed spice and one beaten egg. Mix everything together. Line the bottom of a 22cm long by 12cm wide loaf tin with parchment paper. Put the brack mixture in the tin and bake at 150°C for about ninety minutes (test by inserting a knife, it should come out clean). It’s a good idea to put tinfoil on top of the brack after thirty minutes to prevent the top of it burning. Allow to cool in the tin before turning out on to a plate. If you would like to glaze the brack, brush with melted honey, as you can see I dusted mine with icing sugar. What does this taste like? Something of a fruit cake? It is probably the more unique recipe I’ve read in a long time. 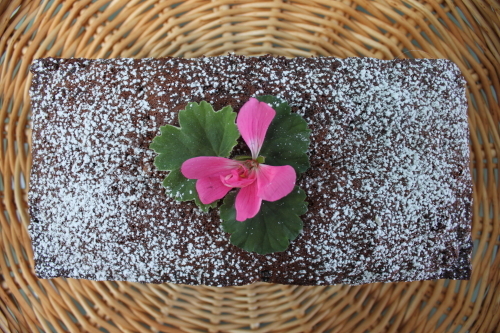 I love the flower and sprinkled sugar… reminds me of my brownies:) Thanks for coming by to visit my blog… because now I’ve found yours!! It’s taste like dense fruit, it’s also very moist and melts in your mouth. I posted it as a dairy free recipe but it taste really good if the slices are smothered in butter. There is a decadent version which involves soaking the fruit overnight in the same quantity of liquid but is made up half and half of cold milk- less tea and whiskey. Thank you for your comment. Dear me, this sounds really delicious. I will have to try it! With *plenty* of butter!! Even though I try to avoid dairy – I always slather butter on a slice of this brack. I found the recipe in an old book by Theodora Fitzgibbon (published in 1970) she says in the book that her grandmother made it by soaking the fruit in a mix of milkless tea and whiskey and that her grandmother’s bracks were ‘very popular with the gentleman’.